Browse > Home / Featured Articles / Will Saudi Arabia establish full diplomatic ties with Israel? 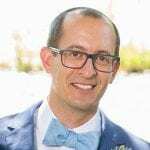 What do you do when you are condemned for allegedly ordering the murder of a journalist and your country is under fire for leading a war in Yemen?…writes Israel Kasnett/JNS. 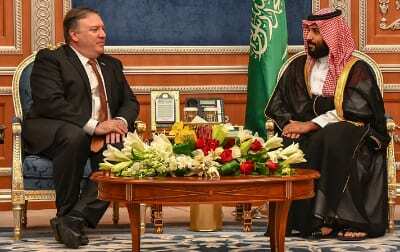 Secretary of State Mike Pompeo meets with Saudi Crown Prince Mohammed bin Salman. Credit: Wikimedia Commons. You try to turn the world’s focus on the Israeli-Palestinian conflict, of course. And that’s exactly what Saudi Crown Prince Mohammad bin Salman (known in media circles as MBS) is rumoured to be doing. Not so fast, say a number of experts familiar with Israel-Saudi relations. 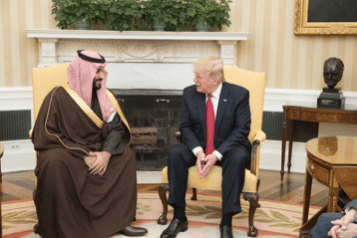 However, according to a report in November, , editor-in-chief of the Rai al-Youm news site, claimed that MBS was touring Arab countries to gain backing for his effort to normalize relations with Israel. U.S. President Donald Trump speaks with Crown Prince of Saudi Arabia Mohammad bin Salman during their meeting at the White House on March 14, 2017. Credit: Official White House Photo by Shealah Craighead. Last week, the U.S. Senate approved a resolution condemning Saudi Arabia over the murder of Washington Post journalist Jamal Khashoggi, as well as for the ongoing Saudi-led war in Yemen. Krasna surmised that there is a possibility—“I would say 20-30 per cent”—that Bahrain, like Oman, might invite Netanyahu to visit without establishing formal diplomatic ties. “This is especially true if the United States and Saudi Arabia encourage it to do so,” he added. Anwar Majed Eski, chairman of the Middle East Centre for Strategic and Legal Studies in Saudi Arabia, doesn’t appear to believe that MBS would establish formal ties with Israel before the resolution of the Israeli-Palestinian conflict, and he also doesn’t seem to agree with Netanyahu’s outside-in approach. That said, “they move and work together to achieve the U.S. interests or strategic policies in the region,” added Swalha. “There is some cooperation and security coordination between the two countries. This is the reality. Swalha pointed to Netanyahu’s recent visit to Oman, and Israeli Culture and Sports Minister Miri Regev’s visit to the United Arab Emirates as one aspect of breaking Israel’s isolation. At the same time, Saudi Arabia refused to issue visas last year to Israeli chess players, thereby disqualifying itself as a host country for the international chess championship. Clearly, that breakthrough for Israel is still far off. Krasna tempered any excitement and laid the idea that Trump would hold a trilateral summit to rest. Both sides have been accused of massive war crimes by the many human rights bodies . Massive with millions at risk of malnutrition at tens of thousands of young children died because of bombing of humanitarian supply lines .